Church Bus Insurance Florida – Huge Savings Call Now! If you’re looking for great rates and coverage for Church Bus Insurance in Florida contact Strong Tower Insurance by dialing 1-800-329-0093 or click on Florida Church Bus Insurance Quotes to send us your request for information seven days per week. Strong Tower Insurance is driven in offering competitive rates on Church Insurance in Florida, Georgia, South Carolina, and North Carolina. No matter if you have one bus, a passenger van or a fleet of vehicles supporting your ministry, we can help you find affordable protection for your Religious Institution. Church Bus Insurance Florida — Why Choose Strong Tower? The average insurance agency selling business insurance is a generalist offering all different types of coverage to small businesses. A trained exclusive licensed agent is a better choice when it comes to insuring your ministry. Why? We understand how to properly cover large and small Churches, Ministry Outreach Programs, Day Cares, Mission Trips, Charter and Private Schools, plus Nonprofit Organizations. It’s very easy to miss important coverage when it isn’t something you do every day. We at Strong Tower Insurance are quite familiar with developing unique coverage options for Faith Based Organizations, even those with unique situations or past claim activity that potentially renders your Religious Organization uninsurable. Additionally we are one of the largest agencies in the State dealing in Florida Church Insurance. You can have confidence we can help you find the best options. Church Bus Insurance Florida — What Coverage is Necessary? Because each Religious Institution may have different needs when it comes to insuring single vehicles or your fleet, picking the right coverage is vital. It’s important to start, first of all, with your Liability Insurance. What is Vehicle Liability Insurance Coverage on the Commercial Auto Policy and how much is enough? Vehicle Liability Insurance Coverage pays for Injuries or Property Damage that you may be held responsible for. Example: Jimmy is a volunteer driver for your church and he drives your 15 passenger van to transport congregation members. It’s Sunday morning and foggy with limited visibility. Jimmy currently has 11 passengers in the van as he is making his way to your church. Suddenly a handful of deer bolt across the road. In an attempt to miss hitting the deer, Jimmy over-corrects and runs the passenger van into a ditch and the van overturns. Everyone is okay except for Cynthia, a longtime church member. Cynthia experiences a severe back injury due to the accident. After being evaluated, the injury is extensive enough that Cynthia may not be able to resume her normal work duties for six months or longer. She makes about $2000 per month and her medical bills amount to $42,500. The Vehicle Liability Insurance Coverage portion under the Commercial Auto Policy will provide compensation to Cynthia. 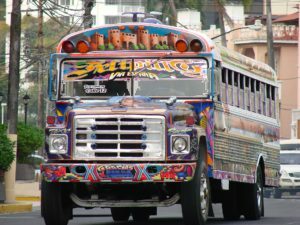 Florida Church Bus Insurance — How Much Is Enough? Unfortunately this is a difficult question to answer for several reasons. Some agents will advise their clients to pick $1 million of coverage. Is $1 million of coverage enough? Perhaps it is, or perhaps it is not. Let’s re-examine the scenario above with Cynthia and assume the accident mentioned above caused Cynthia to become permanently disabled, she is 26 years old, and her medical bills amount to $500,000 initially with ongoing care needed based on her injuries. The church could be found liable to provide compensation for Cynthia for the next 39 years in the amount of $2000 per month or $936,000 plus her medical bills (this assumes no cost-of-living adjustments). $1 million of Vehicle Liability Insurance Coverage would not be sufficient to compensate Cynthia adequately. Who would be responsible to pay the difference insurance did not pay? The church would be responsible. Arbitrarily picking a number of $1 million of Vehicle Liability Insurance Coverage may not be sufficient. This is especially true in our litigious society. In future articles we will break down the Florida Commercial Auto Policy in some detail so you know about the basic options that are available. Why not contact us today to discuss your needs for Florida Church Bus Insurance? Strong Tower Insurance — Standing by Your Side When Things Get Tough! Keep in mind that it is important to review your options and we would be glad to help you pick a coverage you feel is sufficient for your needs. Call 1-800-329-0093 to speak with one of our licensed representatives or click on Florida Church Bus Insurance Quotes to send us your request for information seven days per week.